Lens Description: Enjoy superb value from the SAL-28 f/2.8 wide-angle lens, an excellent choice for sharp, high-contrast shots whether you\'re working indoors, shooting people in groups, or hoping to take panoramic shots of landscapes and urban scenes. 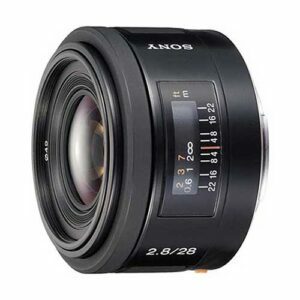 The 28mm lens--which mounts easily on a Sony Alpha DSLR-A100 camera--provides a near-standard 42mm focal length (35mm equivalent), with wide-angle optics and a deep depth of field. The lens's compact size and light weight, meanwhile, make it easy to carry when traveling or performing long shooting sessions. Finally, the lens includes a convenient built-in sliding lens hood that protects your optics and makes it faster to switch lenses.